The Reno Motorsports Off-Road show will have race trucks, motorcycles, ATV’s and trail ready jeeps with everything that is needed to have a casual trail ride on the weekend or win a desert race on display. Throughout the weekend, 2 Time World Trials Champion Tommi Ahvala will take on a giant obstacle course of terrain where he will demonstrate unbelievable precision and control on a motorcycle while never putting his feet on the ground. Best described as Gymnastics on two wheels because it represents a level of difficulty found in no other motorsport. 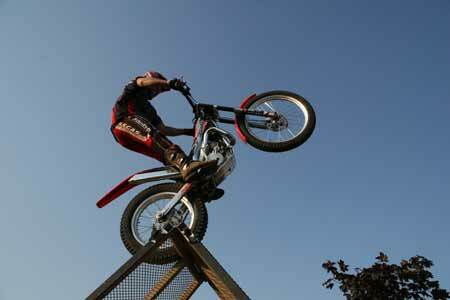 Onlookers will see Tommi ride up a 10 foot pyramid, wheelie his motorcycle on a 4 inch point and climb a 20 foot vertical wall. 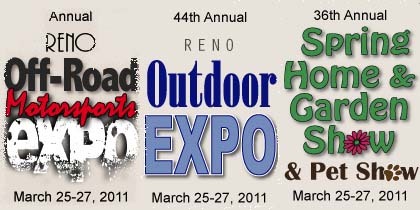 The Reno Outdoor Expo hall will have products for both Summer and Winter adventures including everything needed for an extreme adventure, to a day hiking, or a day on the ski slopes. A large display of RV’s and Boats will be available to shop to find the perfect fit. The Spring Home and Garden Show is for homeowners in all stages of remodeling, landscaping and decorating their homes. Dr. Lori will be onsite all weekend to give appraisals on small household items. Dr. Lori reviews approximately 20,000 items a year and unlike most art and antique appraisers, she has a Ph.D. in art history and does not have an interest in buying people’s objects, thus ensuring an honest, ethical and accurate appraisal and evaluation while adding humor to the show. “You should be a stand up comic, you are sooooo funny and entertaining and knowledgeable!” commented Margaret E from a previous show. The Reno Pet Show will have everything you could think of to pamper your pet, education on how to be a responsible pet owner and will feature a very popular Pug Parade that included over 75 pugs last year. Each Pug will receive a certificate and the best of show will be awarded.